After driving up from home that morning, I parked the car at the Falling Waters/Old Bridle Path trailhead and started up the Falling Waters Trail around 8:30 AM. The day began sunny and about 45 deg at the trailhead. It got warmer as the day wore on, maybe up to 65 deg, and it stayed sunny, clear, and relatively calm all day. Hiking was relatively easy. One hiker passed me on the bridge over Walker Brook and I saw another coming down the trail near the top of Little Haystack; otherwise, I didn’t see anyone else all day. I stopped at to look at Stairs Falls, which is near where our family camped last October. Patchy snow began around 2000 ft, and there were icy spots below Cloudland Falls. 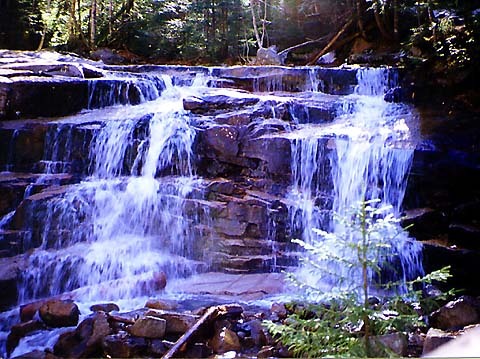 I enjoyed the waterfalls; the view from the top of Cloudland Falls was great, and I could see Mt Moosilauke. I rested there and had a snack. I had read a guidebook that said that the upper portion of the trail was steep and monotonous, but I I enjoyed the switchbacks, the trees, and the occasional views, and did not consider the trail abnormally steep. 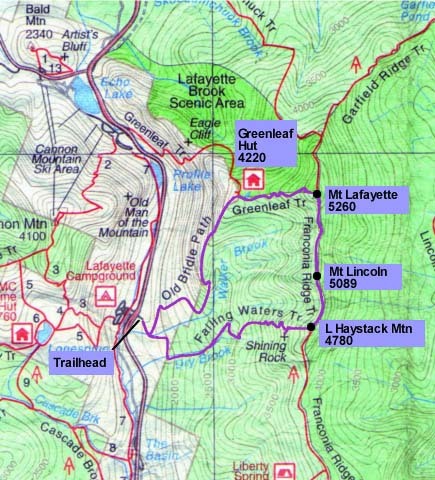 Around Cloudland Falls, I put on my crampons because there were a few patches of ice. 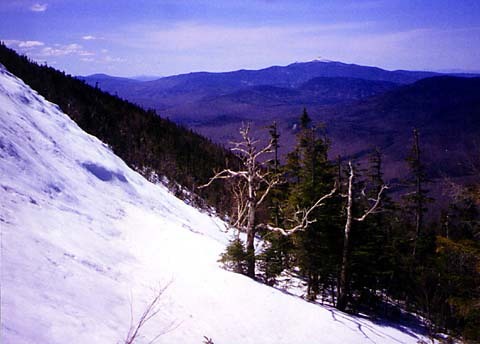 I turned off on the Shining Rock Spur and stopped for a short rest next to the rock, which was covered with snow and looked more like a snowfield. 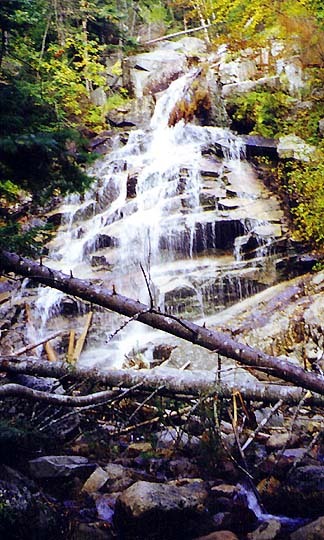 Stairs Falls. These falls aren't too far up the trail. Our family camped near them in October 1998 on a short backpacking trip. Cloudland Falls. 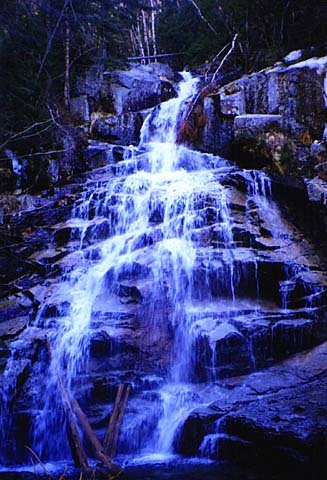 I rested on the rocks at the top of these 80-ft high falls to eat a snack and gaze at Mt Moosilauke. It was a very peaceful spot. 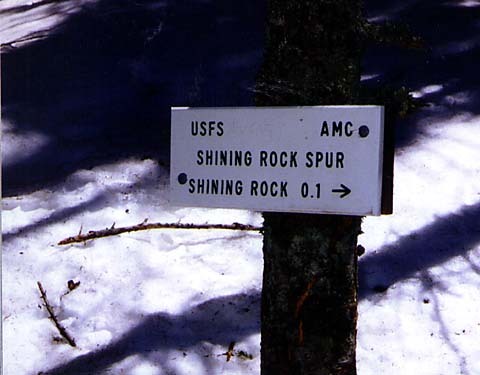 Shining Rock Spur Trail sign. I reached this spur trail sooner than I had expected after a very pleasant climb up switchbacks. Shining Rock. This large exposed ledge normally shines like a mirror down to the notch, as it is usually wet all summer. Right now, it was covered with snow.